I read in Gazeta Wyborcza today that the full moon is at its nearest point to earth (perigee), nearer than at its farthest point (apogee)by a full 40,000 km (25,000 miles). A good once-in-3,233-days opportunity to wield the 80-400mm Nikkor, erect it on a massive tripod, and snap you this glorious full-color (!) snap. "The average centre-to-centre distance from the Earth to the Moon is 384,403 km", says Wikipedia. Today, it is only 364,397 km away. Today it looks at its largest for nearly nine years. I remember the first time I looked at the moon through some powerful binoculars. What an emotional effect that had on me. No more just a silvery disc in the night sky, but a huge hunk of rock sailing around our planet, changing its aspect with the month, sculpted by asteroid collisions, volcanic action and massive lava flows. Look at it hovering over us! Wow! That's quite something, isn't it? Click on the pic to enlarge to full size and look at the impact craters, the straight lines created by ejecta from asteroid impacts, mountains (look at the mountains on the horizon on the bottom right of the picture). Quite something. Michael - one of our friends has a large telescope (nearby to where you are) Fancy a look some night? I'm glad you were lucky and got to see the perigee4 moon - it was cloudy over here so we didn't get to see it. It's nice you did, though! Your first view of the moon through binoculars reminds me of mine when I first saw the moon through the telescope - I had tears in my eyes because it was such an overwhelming sight. Time to get the telescope out again once the sky clears up! You had inspired me to used my ERT-457 Refracting Telescope in the evening. 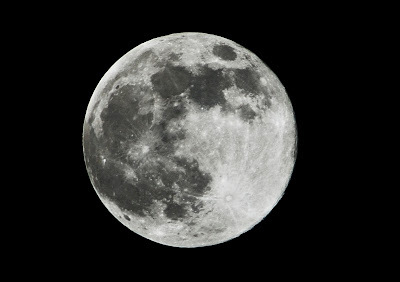 The result was excellent-40 minutes of cloudless sky and full moon.